We caught TRXC for a pretty nice move earlier this month, when we alerted it on the 16th, and the stock went on a two-day run from 2.15 to 4.43, scoring us a solid double-bagger. In the weeks since then, TRXC has been under consolidation, and yesterday, we tagged it once again in our extended watchlist, and the stock produced what may be the start of another solid uptrend. From a low of 2.50, the stock went as high as 3.03, making for a 21% rise on the day, and it maintained more than half of that move into the close on better-than-average volume. We’ll continue to monitor for the establishment of higher highs and higher lows as TRXC attempts to get its next leg-up. 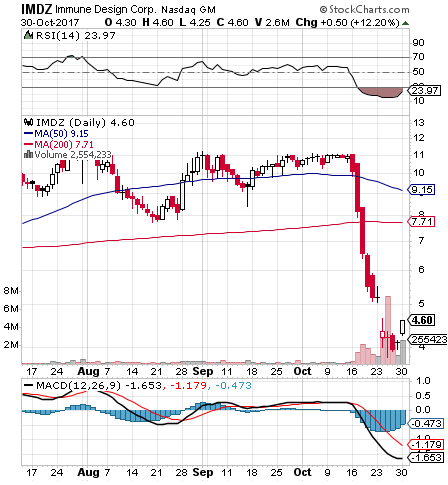 We’ve got an interesting bottom setup on IMDZ, which recently took a massive downturn following the announcement of a large $80M public offering at a price of 4.10/share. It’s also important to note that there was a huge $10M block of insider buying that came in on Friday near the lows. Additionally, as you can see on the chart, the result of the last week of activity is a highly oversold state, and all indications seems to be pointing to the possibility of the stock regaining at least a portion of the ground it has recently lost. Lastly, the company will be a hosting a post-market conference call tomorrow to discuss 3Q earnings and recent developments that you can tune into at http://ir.immunedesign.com/events.cfm after market close tomorrow and for 30 days thereafter. As an added idea, we’ll radar the IMDZ 12/15 $5 Calls for observation in the days and weeks ahead. Those could see some nice activity if the stock has the recovery we suspect it might. We had a really good idea for the TWTR options chain on Thursday morning with the Weekly $18-19.50 Calls. Not only did they make multi-bag gains on Thursday, but with another bullish session Friday, our total possible profits were extended by a significant margin. We’ve listed the overall moves below, in addition to the intraday gains that were available on Friday alone. We tagged BONT on Thursday morning, at which time we observed a low of .68 in the stock. After a solid first session, we reiterated the tag in Friday’s report and the stock came out of the starting gate like a bolt. It traded all the way up to 1.15 before tapering back, but not before completing a two-day swing of 69% for us. The stock’s presently hovering around a dollar, so we’ll be watching as the new trading week kicks off this morning to see if BONT can manage to string together a third session of higher highs and higher lows. We made our interest in the WBA options chain very clear yesterday morning, stating that “in addition to exceeding expectations with their quarterly report, the stock was already looking ripe for a bottom bounce.”. As it turned out, our shrewd premarket observation made it possible for our readers to bag some truly epic gains on the day in three out of the four highlighted contracts . Our designated targets were the WBA Weekly $69-70.50 Calls and the moves they made on the day were astonishing, including an absolutely eye-popping 78-bagger, even as the markets as a whole had the worst down-day in months! $69.50 Calls – Range: .06-.59 – Max Gain: 883%. We’ll continue to keep an eye on these ideas as we head into the end of the week. We’ve also got a frsh options idea for TWTR, after noticing a significant gap-up in the stock here in the premarket. The company Q3 earnings showed it is inching very close to profitability, which could happen as soon as next quarter, and traders are responding. TWTR is presently filling a big gap on the chart, and has the look of a play that could produce a significant dip-and-rip once the session commences. We’re going to be looking at the TWTR Weekly $18-19.50 Calls. SPECIAL ALERT: Tune into an exclusive CEO interview we’re conducting via our sister site, StockTradersTalk.com with Troy Lowman, CEO of SNM Global Holdings, Inc (OTCMKTS:SNMN). The audio will be available beginning at 10AM this morning, and permanently archived thereafter. Simply visit StockTradersTalk.com after 10 o’clock! We’re coming back to ATOS for the third consecutive day this week, after our initial alert in Monday’s report, and on that morning we observed a low of .50, followed by a modest but solid run 27% to .636. We were also reminding readers of the conference call the company has scheduled for 10AM this morning at www.atossagenetics.com. Our post-earnings beat options ideas for CAT yesterday morning were the CAT Weekly $136-141 Calls. While every set of contracts did see upward movement, we’re only going to list the numbers for the $136-138′s, as the gains in the $139-141′s were minimal by comparison. We did however, see two separate chances for swing trades on the day. $136 Calls – Swings: 2.75- 4.03 (+ 47%), 2.00-3.04 (+52%). $137 Calls – Swings: 2.05-3.20, (+56%), 1.38-2.21 (+60%). $138 Calls – Swings: 1.60-2.42 (+51%), .91-1.55 (+70%). We noticed WBA this morning on the premarket earnings calendar, and in addition to exceeding expectations with their quarterly report, the stock was already looking ripe for a bottom bounce. We’re going to signal the WBA Weekly $69-70.50 Calls for observation for the remainder of the week.